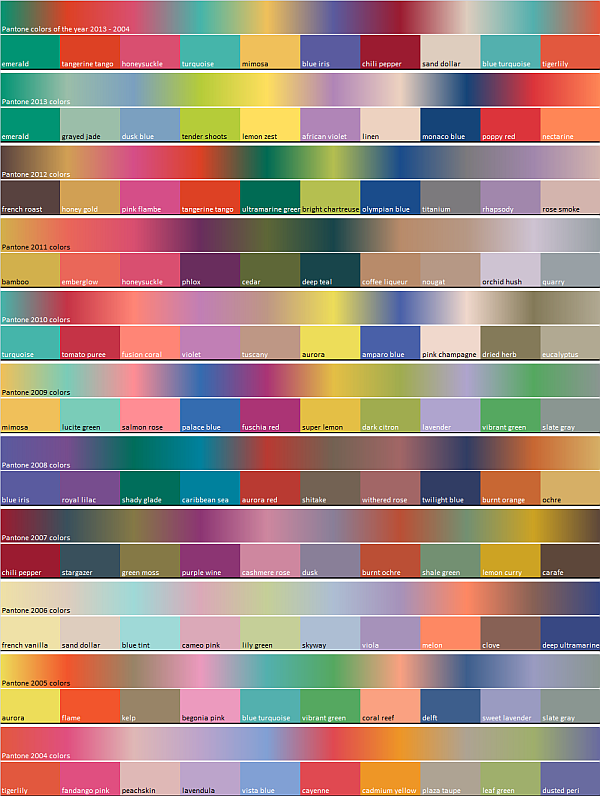 Create a sheet that presents a swatch for each years Pantone colors, a ramp of those colors showing the transition between them, and a summary swatch of each of the colors of the year. 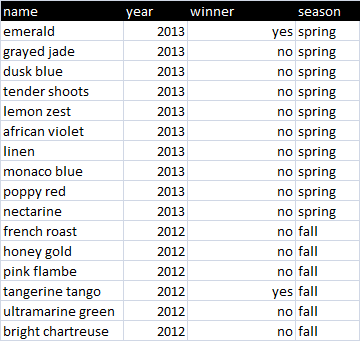 The actual colors will be looked up name as described in Looking up color table. Most of what we'll use here is a mash up of code written for other sections in Color Fiesta and available the libraries in the cDataSet.xlsm workbook. Here's the code for creating the diagram above - a lot can now be achieved in a small number of lines of code rehashing what we've already done. 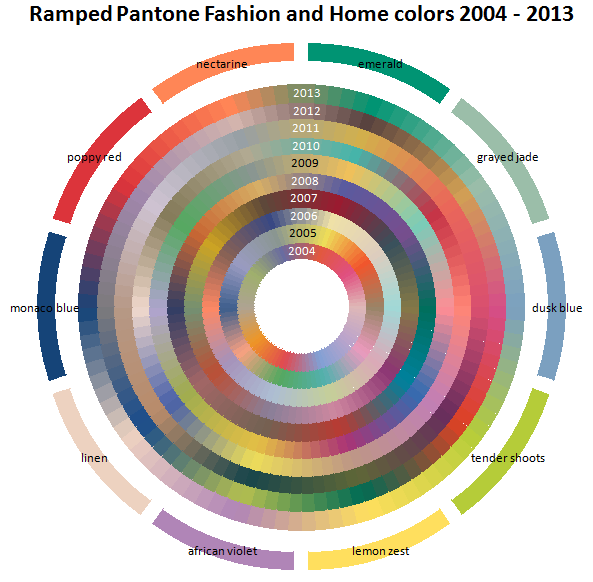 Let's look now at how to make a circular ramp of all that, using code from How to create a heatmap doughnut chart and Alternative ramp layout. When I first plotted this, I was using a high granularity, meaning that the colors merged round the ramp in the circle smoothly. Trouble was that it looked a bit crazy - so i turned down the granualrity and we have the effect you find in color swatches of lots of little variations in color. I think this looks a little better. The 2013 colors are shown round the outside - the others are the colors of the respective years. Here's the code for creating the diagram above. For now I specified the colors in the order they came in the Pantone press release of the time. It would be nice to get the tints lined up with each other so we can see better how color fashion has changed over the year. If I get round to it, I'll create something to sort colors in some order that bring similar colors together. For help and more information join our forum,follow the blog or follow me on twitter.